For many use cases writing pandas in pure python and numpy is sufficient. In some computationally heavy applications however, it can be possible to achieve sizeable speed-ups by offloading work to cython. This tutorial assumes you have refactored as much as possible in python, for example trying to remove for loops and making use of numpy vectorization, it’s always worth optimising in python first. This tutorial walks through a “typical” process of cythonizing a slow computation. We use an example from the cython documentation but in the context of pandas. Our final cythonized solution is around 100 times faster than the pure python. We have a DataFrame to which we want to apply a function row-wise. By far the majority of time is spend inside either integrate_f or f, hence we’ll concentrate our efforts cythonizing these two functions. In python 2 replacing the range with its generator counterpart (xrange) would mean the range line would vanish. In python 3 range is already a generator. If you’re having trouble pasting the above into your ipython, you may need to be using bleeding edge ipython for paste to play well with cell magics. Already this has shaved a third off, not too bad for a simple copy and paste. It’s calling series... a lot! It’s creating a Series from each row, and get-ting from both the index and the series (three times for each row). Function calls are expensive in python, so maybe we could minimise these by cythonizing the apply part. 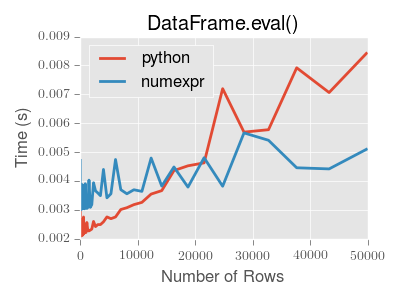 We are now passing ndarrays into the cython function, fortunately cython plays very nicely with numpy. The implementation is simple, it creates an array of zeros and loops over the rows, applying our integrate_f_typed, and putting this in the zeros array. In 0.13.0 since Series has internaly been refactored to no longer sub-class ndarray but instead subclass NDFrame, you can not pass a Series directly as a ndarray typed parameter to a cython function. Instead pass the actual ndarray using the .values attribute of the Series. As one might expect, the majority of the time is now spent in apply_integrate_f, so if we wanted to make anymore efficiencies we must continue to concentrate our efforts here. Even faster, with the caveat that a bug in our cython code (an off-by-one error, for example) might cause a segfault because memory access isn’t checked. Loading C modules into cython. Read more in the cython docs. The top-level function pandas.eval() implements expression evaluation of Series and DataFrame objects. To benefit from using eval() you need to install numexpr. See the recommended dependencies section for more details. 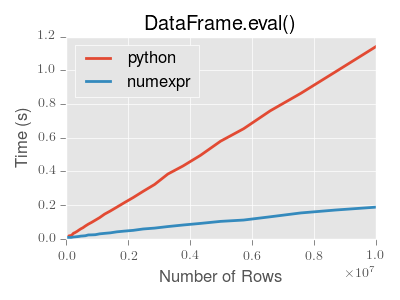 The point of using eval() for expression evaluation rather than plain Python is two-fold: 1) large DataFrame objects are evaluated more efficiently and 2) large arithmetic and boolean expressions are evaluated all at once by the underlying engine (by default numexpr is used for evaluation). You should not use eval() for simple expressions or for expressions involving small DataFrames. In fact, eval() is many orders of magnitude slower for smaller expressions/objects than plain ol’ Python. A good rule of thumb is to only use eval() when you have a DataFrame with more than 10,000 rows. eval() supports all arithmetic expressions supported by the engine in addition to some extensions available only in pandas. The larger the frame and the larger the expression the more speedup you will see from using eval(). Neither simple nor compound statements are allowed. This includes things like for, while, and if. should be performed in Python. An exception will be raised if you try to perform any boolean/bitwise operations with scalar operands that are not of type bool or np.bool_. Again, you should perform these kinds of operations in plain Python. In addition to the top level pandas.eval() function you can also evaluate an expression in the “context” of a DataFrame. Any expression that is a valid pandas.eval() expression is also a valid DataFrame.eval() expression, with the added benefit that you don’t have to prefix the name of the DataFrame to the column(s) you’re interested in evaluating. In addition, you can perform assignment of columns within an expression. This allows for formulaic evaluation. Only a single assignment is permitted. The assignment target can be a new column name or an existing column name, and it must be a valid Python identifier. If you don’t prefix the local variable with @, pandas will raise an exception telling you the variable is undefined. When using DataFrame.eval() and DataFrame.query(), this allows you to have a local variable and a DataFrame column with the same name in an expression. In this case, you should simply refer to the variables like you would in standard Python. There are two different parsers and two different engines you can use as the backend. The default 'pandas' parser allows a more intuitive syntax for expressing query-like operations (comparisons, conjunctions and disjunctions). In particular, the precedence of the & and | operators is made equal to the precedence of the corresponding boolean operations and and or. For example, the above conjunction can be written without parentheses. Alternatively, you can use the 'python' parser to enforce strict Python semantics. The and and or operators here have the same precedence that they would in vanilla Python. There’s also the option to make eval() operate identical to plain ol’ Python. Using the 'python' engine is generally not useful, except for testing other evaluation engines against it. You will acheive no performance benefits using eval() with engine='python' and in fact may incur a performance hit. eval() is intended to speed up certain kinds of operations. In particular, those operations involving complex expressions with large DataFrame/Series objects should see a significant performance benefit. Here is a plot showing the running time of pandas.eval() as function of the size of the frame involved in the computation. The two lines are two different engines. Expressions that would result in an object dtype or involve datetime operations (because of NaT) must be evaluated in Python space. The main reason for this behavior is to maintain backwards compatbility with versions of numpy < 1.7. In those versions of numpy a call to ndarray.astype(str) will truncate any strings that are more than 60 characters in length. Second, we can’t pass object arrays to numexpr thus string comparisons must be evaluated in Python space. the numeric part of the comparison (nums == 1) will be evaluated by numexpr. In general, DataFrame.query()/pandas.eval() will evaluate the subexpressions that can be evaluated by numexpr and those that must be evaluated in Python space transparently to the user. This is done by inferring the result type of an expression from its arguments and operators.